As part of 2014’s issue of Neutral Magazine, I was lucky enough to visit the 20th Viva Spanish and Latin American Film Festival in Manchester! 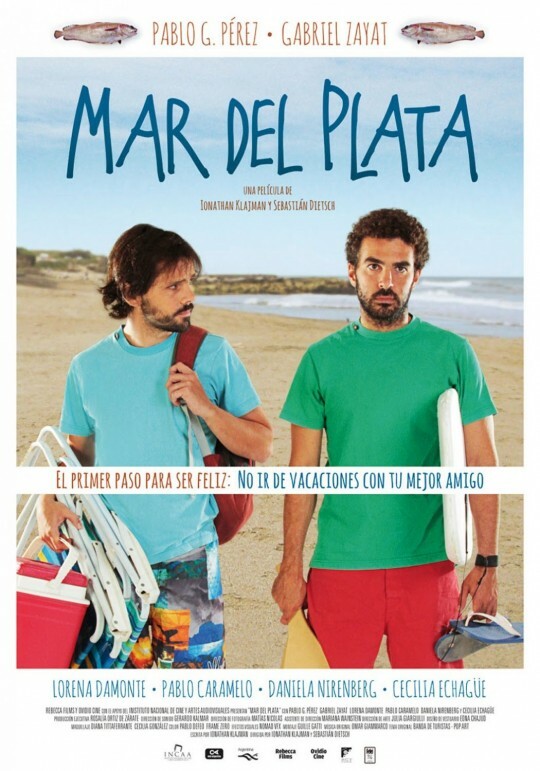 I watched two films and reviewed one; the hilarious buddy comedy Mar Del Plata. Relive my experience here or over at the Neutral 2014 website. This Argentine off-beat movie, written and directed by Ionathan Klajman and co-directed by Sebastian Dietsch in their debut, is a wonderful example of the universality of friendship. Everything about this film felt so familiar, from the buddy road trip storyline to the failing relationships and yearning for a simpler time in childhood. The story begins when Joaquin is given a free weekend trip to Mar Del Plata by his antiquated father, and invites his childhood friend David for whom the journey couldn’t come at a better time; his wife has gone to stay with her mother after what she felt was neglect, and he’s unsure whether he still loves her. Joaquin is going through a similar slump as his wife left him only two months previously, and he begins to dwell on his failed relationships. As a twist of fate, another holiday is being taken at the same time by Elena, Joaquin’s first real girlfriend who broke his heart, together with her husband of two years who also happens to be a highly successful writer. Joaquin and Elena find each other on the dank-looking beach and old feelings resurface, especially when David occupies her husband Vega with the threat of exposing him as a fraud. Mar Del Plata has all the right ingredients to go into an off-beat dark comedy indie, something in the vein of Little Miss Sunshine or Juno. The film constantly plays with the fourth wall, switching from non-diegetic to diegetic music in amusing ways while Joaquin speaks directly to us. When he talks about his childhood, and his first ever fight with David, we’re shown the story in 8mm footage; in a brief journey through his ancestry, he flicks through images on a ViewMaster. This isn’t just a technique to evoke nostalgia though, as these media forms fit seamlessly with Joaquin’s personality – his apartment, littered with dead plants, is indicative of his man-child state, especially now that he’s single. So much is told about the characters through tiny acts, especially when David relives his childhood by releasing chickens in an act of rebellion, and perhaps hope for freedom. The beach itself feels like something you would find in England – it’s dank and grey and the water looks unpleasantly cold. It’s obviously an off-season trip as there are very few extras on the beach, and they sit placidly so as not to distract from the action in front of them. All of the realism in this film is brought into harsh focus, down to the creaking of David’s crummy car, the white Styrofoam body board and the tacky plastic, stripped doorway of the hideous diner they come across. What makes this film feel even more familiar is the constant mention of football; one of Joaquin’s biggest victories in life was scoring a Chilean goal as a child, and David seems to measure years in World Cups. Culturally, it felt more familiar than an American film. No one is a hero in this film, and no one is a villain – sure, Elena’s husband is obviously a bit of a scumbag, but she isn’t exactly a saint either. That’s one of the triumphs of the film, that it shows human flaws in such a brutally honest way but also ensures that we’re encouraged to think about the other side of the story. It’s a given for most of the film that David has acted neglectfully toward his wife, until he points out that there were reasons why he seemed unsympathetic at the time. Joaquin acts quite cruelly to Elena, despite the fact that she broke his heart in the first place; seeing her only aggravates the wounds of his recent separation, and she cruelly leaves her husband by telling him it’s all his fault. Mar Del Plata doesn’t point any fingers; it treats morality with ambiguity, so we aren’t left feeling judgemental toward any of the characters. These are just normal guys, who as children felt that they could have amounted to anything if they just tried enough, and have been struggling ever since to come to turns with the harsh realities of adult life. In comparison to the Chilean film Le Passion De Michaelango which Daria has reviewed, it felt like a universal story, one not bound to ethnicity or location – it felt humble, sad, and warm, like the memory of a childhood sweetheart.